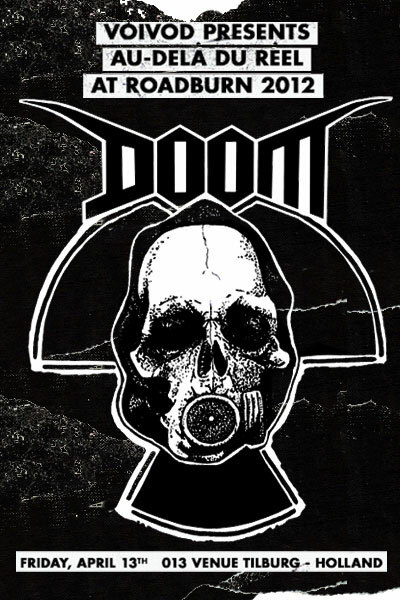 It is with a great sense of pride that Voivod and Roadburn announce that crust punk legends DOOM will celebrate 25 years as a band at Roadburn 2012‘s Voivod-curated Au-delà du Réel event on Friday, April 13th. Formed in 1987 amidst a great deal of political tension and economic chaos, Doom took the furious thrash punk assault of Discharge, Broken Bones and G.B.H., fused it with the emerging grindcore sounds of Carcass and Napalm Death and bellowed their dissatisfaction at the world. Doom delivered their social critique in venomous, intensity filled bursts, rarely having songs longer that 90 seconds. Their pounding drums, wall of razors guitar style, and hoarsely barked messages captured the feelings of a generation perfectly, and their sound and message are just as powerful today in a world that seems more than ever plagued by political tensions and economic catastrophes. Tickets for Roadburn 2012 will go on sale Saturday, November 26th, 10:00 Central European Time. There will be a 2 ticket limit (per order) for 3-day and 4-day passes and Afterburner tickets –the same goes for the Campsite Tickets.